Everybody knows Sony – they need not much introduction. 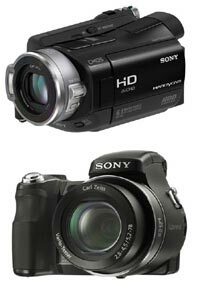 We sell the whole range of Sony’s consumer digital imaging products. Please contact us for a quote or information on any Sony model you are after. Sony is a company devoted to the celebration of life. We create things for every kind of imagination. Products that stimulate the senses and refresh the spirit. Ideas that always surprise, and never disappoint. Innovations that are easy to love, and effortless to use. Things that are not essential, but hard to live without. We are not here to be logical or predictable. We’re here to pursue infinite possibilities We allow the brightest minds to interact freely, so the unexpected can emerge. We invite new thinking so even more fantastic ideas can evolve. Creativity is our essence. We take chances. We exceed expectations. We help dreamers dream.